Picture shows E215 and E216 BTA together. E216 BTA (below) is about to work a 76 to Callington, where E215 BTA has just returned from a trip to Wembury on the 48. With all the recent fleet updates that have been happening in the area, there, as has been reported, been a considerable loss of high floor vehicles. The latest to go are the two E reg Volvo Citybus' these being E215 BTA and E216 BTA. 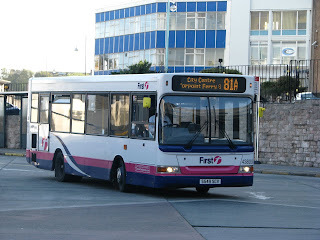 These two buses (along with sister E217 BTA scrapped a few years ago) have become quite a symbol of Plymouth. The three were new back in 1988, numbered 1815 to 1817. These fleet numbers were originally going to be Leyland Olympians, though the National Bus Company moved these three to Maidstone, where they staied. The Citybus' were bought specially to run the X38, back when Western National operated the service. These did many years of hard graft to Exeter, until the K-ORL batch took over in 1993. Though when Badgerline bought Western National, the BTAs were moved upto Bristol to operate alongside the D-GHYs, as this was a more common type in Bristol. Ironically all of the D regs are now working in Cornwall, albeit by the skin of their teeth.1815 and 1816 made it back down in Plymouth where 1817 remained in Bristol until she was scrapped in 2005. This was only a temporary move, though in fact 12 years extra service has been gained by these two, on their move to Plymouth. The Citybus' have been used for a whole manner of different tasks since then, longer distance such as 93 and 76. They've been used on the Ugobus network, commonly seen on service 3. And E215 BTA was even used for a wedding trip, when the Routemaster failed! So we bid farewell to the last reminder of the Western National era. Yes I know the W-PAFs are technically Western National, but does a Volvo B6 really represent that era? So we say goodbye to these from the streets of Plymouth. But who knows, the 2 may join the D-GHYs as open toppers in Penzance. Only time will tell. Well what was going to be a quite innocent and hopefully uneventful journey down to Truro turned from 2 hours into 4 hours! I set my sights to try out the new 581 operated by Western Greyhound. But before I even got to this, there were troubles. My 81C was running 10 minutes late in the hands of Gerald Dover, so we cut it quite fine when joining the 581. The journey then onto Liskeard was very pleasant aboard Vario WK04 HSD, makes a nice change having a proper manual gearbox. On reaching Liskeard I had plenty of time to get into the station to catch the train. But as I walked into the waiting room, what was there to greet me but the board flashing *0850 Penzance CANCELLED* So what else could I do but join the 581 again back into Liskeard. 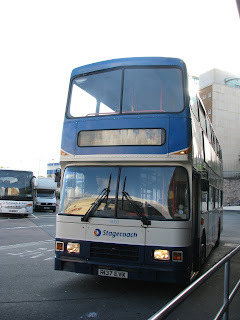 Sadly there wouldn't be a bus down into Cornwall for 50 minutes, so I continued right back to Torpoint again. But what I then didn't realise was how fine I was then cutting it with the next train to Truro. And to make it worse, the 81 that was scheduled wouldn't meet the train. Luckily Gerald came to my rescue with a late running 81A, so I hopped on with him, a quick blast into Royal Parade and the back out upto the station on a 1, just in time to meet the 10:33. I can now definitely see that advantages of the 81A! 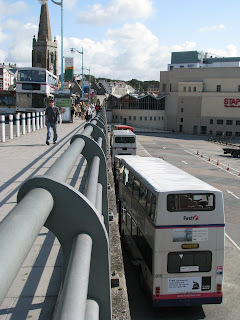 On reaching Truro, I boarded a seemingly forever packed, service 14 to the bus station. There was relatively little buses of interest. Even the G reg Leylands are becoming few and far between. With my day reduced by 2 hours this also dramatically limited what I could do within the time, restricting me to Truro routes only, different from what I'd planned. It was the usual kind of things, though more and more Solos seem to be running down there. Also new service 500 operated by Western Greyhound was seen with a brand new '59' plate Mini Optare Solo. I also bumped into Mr Coates who I had a ride from St Austell to Truro aboard K608 NAE, one of the recent arrivals from Bristol. And if i'm honest, they've not the nicest thing to ride on with those seats! I'd forgotten what real bus seats were like, as really the what used to be standard design is quite few and far between, in favour of more comfortable designs. Back up in Plymouth however, there were a few more interesting observations to me made. There is now much more evidence of Volvo B7s in the city, they are rapidly increasing in number, and there are still more to come. Very different to the bar war of previous years where any old thing was put into service. Now which bus war did we prefer! On the note of 'older' buses, a Volvo Olympian was seen on the X38 this evening! This is now a very rare sight, with either a Trident or Enviro 400 as standard operation. I know what I'd pick! Surprisingly the Volvos are quite well suited to the route when I travelled on one on the route a couple of years ago. Though really the old P reg B10Ms are irreplaceable in my eyes. That's what is really needed on a route such as X38. 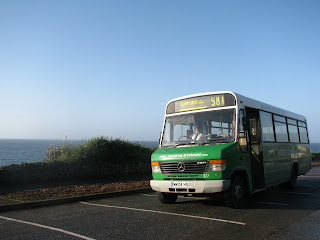 Also Countrybus' Mercedes 709 P475 FJF was seen operating towards Totnes. Again a reminder of a bygone era. 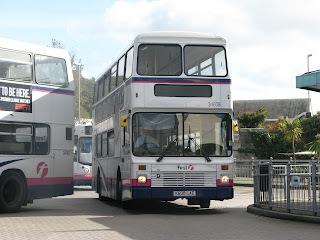 Even Countrybus' 709s are starting to dwindle, with one coming up for sale on ebay this week. 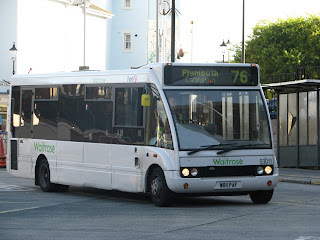 The 76 today was being operated by the Waitrose liveried Optare Solo W811 PAF, something that would have previously been very rare to see on such a route. Where as Ex-Callington Driver, Dave of VR news was driving an 83. I finally got a trip on Torpoint's 'new' Dart today, 43809, and if i'm honest, she's not the nicest Dart I've ever been on. Bit underpowered, with not enough leg room, even for me. As usual the half 4 81C was packed, where as Dennis Trident 32762 was only 20 minutes behind, would likely be carrying very few on its journey back to Torpoint. Interesting to note though that all 3 Mercedes Varios that are currently allocated to Torpoint were tucked right in the corner of the depot, behind the cars. Could this be the end for the Vario at Torpoint? Or just stuffed out the way until required in the week. Time will tell! The link below is well worth a look. 'vss1x' of Flickr has put this photo online of C412 and C413 HJN together in there new home at Wern. Though the 2 have moved on yet again to a buyer in Nantwich. Great to see them both still alive and well, looking pretty unscathed at the moment. Sadly there are no confirmed details on what will now happen to the sisters, but they seem to be getting further and further out of reach. 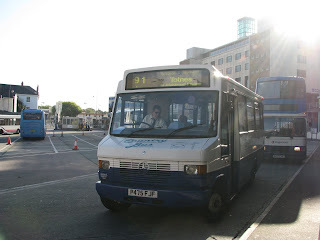 As I have mensioned in previous blogs, 81A is now in effect an X81, cutting out the journey via Stoke and the station etc and going straight down Devonport to the City Centre along Union Street. I finally managed to get a picture and as you can see for some reason a Vario is on it, even at this peak time! Sorry for the quality but my phone's shutter speed seems to be perfect for taking photos of digital blinds!